Love this place! For one supporting locals is great for the community, and for 2 just amazing, caring people work and own it. &#65533; thank you. Borthwick is a fantastic store with fantastic people. Skilled goldsmiths. Good prices. Knowledgeable and resourceful. Handcrafted and custom pieces. Quality work. It's great to work with a store that still has the feel of a small town jeweler - personable, accommodating, and professional. Amazing! I have gotten several beautiful pieces and so unique not the same stuff you are going to find in a big box store. If you have something extra special in mind they will find it for you or even make. I am just in love today with all the wonderful pieces today as I was the day I got them. I look forward to years of friendship with this special memory making team. Erin Lewis is very knowledgeable and has an amazing eye. Have been a long time customer of Tom's and most recently my mom, newly widowed took their wedding rings in for suggestions and he created the most beautiful pendant morphing the two into one exquisite prescious jewelry piece. The BEST place for jewelry. I love this jewelry store!! Their selection and customer service rates an A+++!! Always friendly, great service. And not out to get your last penny. There isn't a better jewelry store around! Go see Tom before anyone else. We brought in a ring that was in dire need of a redesign. This wasn't just a random ring...it was one given to me by my husband to celebrate my kicking cancer to the curb 25 years ago..I had another bout with cancer just a few months ago and kicked it once again. This ring is so special to me, and the addition of a larger diamond and a complete "face lift" took this ring from PRETTY to GORGEOUS. WOW!! It's stunning. You went over and above on this one, and I know it. So very grateful. You will always get referrals from us. Always!! There aren't enough words to express how impressed I am with Tom and his staff. Each time I come in I am greeted with a smile and a sense of family. It is hard to not smile! They are wonderful and the quality of their merchandise is top notch. It is worth the drive to Ferndale for such excellent customer service and craftsmanship. Love it, love it, love it!!!! I brought 2 rings to be resized and Tom did a beautiful job! They looked better than they did when I left them with him! So then I asked him to redesign my engagement ring to let more light through the diamonds - I was thinking I had to buy a new setting altogether but he saved me the expense and reworked the existing setting. I am delighted with the design, the excellent workmanship and his very smart idea of keeping the original band, just changing it up a bit. And, again, the ring looked much prettier and better than new! Thank you Tom. Borthwick is now our go to jeweller. My wedding rings needed a half shank and they did an incredible job. From excellent customer service to price to workmanship, it was a fantastic experience. So pleased! my mom bought me a custom ring from tom for my 18th birthday 8 years ago and its still as beautiful as ever... he did a wonderful job on it!! Tom and his staff are fantastic, friendly, caring and helpful. I don't go any where else for my jewelry or jewelry repair needs. They go out of their way to make it just right for you. First time I went to Borthwick my engagement ring was loosing it's diamond, not only did Tom repair it with stronger teeth to hold the diamond he replaced the diamond with a bit larger one at no additional cost to me. It's been 10 years and the teeth on my ring are still holding the diamond strong. 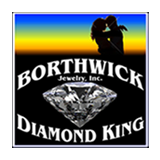 Thank you Borthwick Jewelry for all your wonderful work and caring about making your customers satisfied and happy. My fiance brought my engagement ring in to be sized...the ring fits perfectly and the jeweler also repaired a couple of the prongs at no additional charge. We have decided that Borthwick Jewelry will be the only place we shop for jewelery in the future!!!! This the place to go...Honest and has a geat selection of beautiful and unusual thing to choose from..He is so helpful.. The soldering is barely visible! The wire-wrap superb! The rosary you created is heirloom quality. Thank you. Want a friendly, helpful, courteous, reasonably priced jeweler? Borthwick's is the place to go. If he doesn't have it, he'll find it, order it or maybe even make it. Tom is the best I've found in my 75 years of living in 5 different states. Thank you Tom for all your time and attention in finding the perfect diamond for our 25th anniversary! You are the best!!! I like the unique and beautiful display of jewelry. I have been a customer for 7 years and I still am. Why? Because of the excellent selection, quality and the best service. Thanks Tom and your staff. I have had a lot of jewelers, but I have never had the service like I got from Tom/ Borthwick jewelry. And the beautiful selection. Thanks Tom and staff. We spent months looking for the perfect engagement ring. The department stores did not seem to know what they were talking about and did not listen to what we wanted. My brother recently had bought his engagement ring for his fiance at Borthwick and told us to check there. He said we would really enjoy working with Tom. Well, my brother was right. My fiance (I said yes!!) and I got a BEAUTIFUL engagement ring at a very fair price. Tom taught us all about diamond shopping and made sure we were pleased with out selection. He even went out of his way to make sure my fiance had the ring in time for our trip, which is when he proposed. We were very pleased and appreciated all of Tom's work! My whole family have been customers of Borthwick Jewelry for the past 2 years. They are always upbeat, knowledgable and extremly helpful with new purchases and repairs.